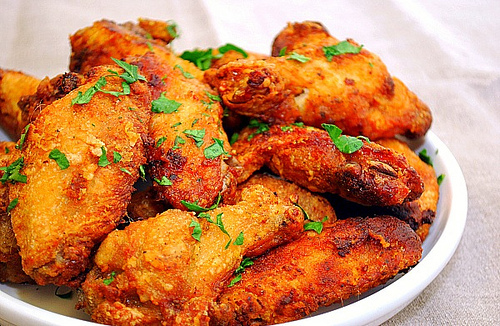 Lemon pepper is a great choice for seasoning chicken wings. They are also very quick to make and can serve anywhere in no time at all. Here're 5 great recipes to try! Chicken wings are a great and versatile food for appetizers, main dishes or easy meal for your family and friends. Cooked just right they are healthy and low in calories. There are many ways to cook chicken wings with a variety of flavors and sauces. Although wings are small, you can either save the wings in your freezer when you cook whole chickens. Just remove the wings from the chicken prior to cooking at the main joint section that attaches them to the bird. You can also buy bags of frozen wings that are already cut into separate "drumettes." The meat department at your local store may also have fresh packaged wings for purchase. It usually depends on how many you will need either enough for a party or just enough for a meal for two. Since they are small, feeding two for dinner usually takes about 6 to 8 wing sections per person when served with a side-dish. For an appetizer at parties, figure on needing about 2 to 4 wing sections per person. Many people think "buffalo wings" when they think of chicken wings. For some, "buffalo wings "may be a bit spicy and difficult to make. 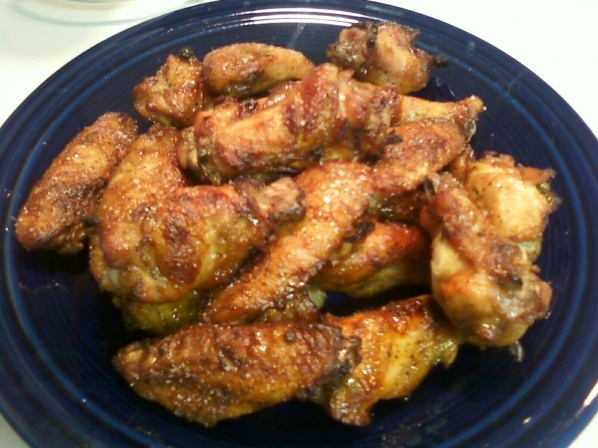 One alternative is lemon pepper wings and they are quick and easy to prepare. You may even have the ingredients in your kitchen cupboard right now. Lemon pepper is usually a staple in most spice cabinets and is a tasty way to flavor chicken wings. Heat up oil in deep fryer. Place seasoning in a bowl or zip style bag and set aside. Deep fry wings for about 8 to 10 minutes until lightly browned. Take cooked wings and place into seasoning and coat. Make sure the wings are still hot in order for seasoning to stick. Fill fryer or large pot to the halfway point or recommended amount in deep fryer and preheat to 350 degrees. Season chicken wings with salt, seasoning salt and pepper. Sprinkle with some parsley and coat in mustard. Roll chicken in flour, place in hot oil and cook about 10 minutes until they float and are lightly browned. Cook wings in small batches a few at a time. Squeeze lemon juice into a bowl. Place cooked wings into the lemon juice and then coat with lemon pepper seasoning. Place in a dish to serve with the following dipping sauce. Mix the mayonnaise, lemon juice, the zest of one lemon, salt and pepper to taste in a bowl. Serves: It depends on how many you need for an appetizer or a meal. 12 chicken wings separated at the joints to make 24 pieces. Tips can be frozen to make broth later. Preheat oven to 400 degrees F. Line your baking dish or sheet with foil. While oven is preheating, rinse chicken wings and lay on paper towel to drain excess water. Dip each wing section in olive oil or butter and then coat with lemon pepper seasoning. Place wings into baking dish or baking sheet. Bake wings for 30 minutes until golden brown and until the skin is crisp. You can turn on the broiler to crisp wings. Make sure juices run clear. Serve with a side of bleu cheese, ranch or other dressing as a dipping sauce. Serves: This recipe yields about 16 whole wings and depends on how many you wish to serve to each person. Mix 6 tbsp. Kosher salt, 6 tbsp. sugar and 6 cups of water in large bowl or zip bag until dissolved. Add chicken wings to bowl or bag and brine for 1 hour in the refrigerator. After 1 hour, remove chicken from brine mixture, rinse under water and pat dry with paper towels. Heat grill to 400 degrees F. Mix 1 tsp. Kosher salt and rest of seasonings together with lemon zest. Press down on the lemon zest as you mix to release the lemon oils into the seasonings. Place chicken wings in large empty bowl and sprinkle with a little olive oil just to coat. Sprinkle in lemon pepper seasoning a little at a time while rubbing into wings. Grill wings for 15 minutes and turn, cook another 15 minutes and turn again. Keep turning every 15 minutes until chicken begins to fall apart and the skin is crispy and browned. The juices will run clear when pressed. Total cooking time is about 45 minutes to 1 hour. Serves: Buy enough chicken wings for the amount of servings you need. Put the chicken wings into the zip bag and add 2 tbsp. olive oil, salt, black pepper and garlic powder. Close up bag and shake until wings are well coated with seasonings. Remove chicken from bag and line them out on the baking sheet. Place in an oven heated to 375 degrees F for about an hour. In the large bowl, combine honey, lemon pepper and 1 tbsp. more of the olive oil. Add cooked chicken to the sauce in the bowl and toss well. This recipe can be served with just about any side-dish or by itself as an appetizer. Bon appetite!